Myanmar – a magical, deeply spiritual country boasts with spellbinding pagodas, awe-inspiring cultural & natural heritages and pristine white sand beaches. 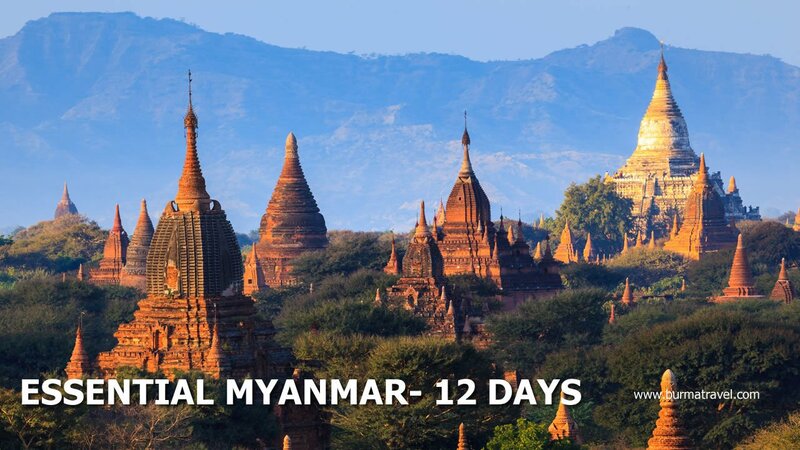 First and foremost this land is perfectly complemented by a most gracious and hospitable people.Take advantage of new direct flight from Bangkok to Mandalay, we created this 12 day trip give you the depth of the country, the trip start in Mandalay and end in Yangon or vice versa. Please contact our travel consultant for more details and the best offer. 2 Domestic flights: Bagan – Heho, Heho – Yangon. Mingalabar! Arrive at Mandalay International Airport, Burma Travel guide and driver will welcome you. Now we head to Mandalay pier, embarking on a private boat upstream to Mingun. Now we visit the incomplete Pahtodawgyi Pagoda. Head to Mingun Bell, 90-ton bell which is the world 2nd largest one and still in good condition. Don’t forget to ring it. In the afternoon, we head to Mandalay Palace – the last royal palace of the last Burmese monarchy and Shwenandaw Monastery, the single remaining major original structure of the original Royal Palace today. Proceed to Kuthodaw Pagoda, a Buddhist stupa that contains the world’s largest book. If time permits, we have a visit to the gold leaf beating workshop. Finish the tour by visiting Mandalay Hill to watch the sunset and panoramic view of the city. This morning we take 2 hour scenic drive uphill to Pyin Oo Lwin, formerly Maymyo – a British Hill Station located on a plateau 1,070m above sea level. Visit the colorful local market near the Purcell Clock Tower. Take a horse drawn carriage through the streets to see the unique brick and timber British colonial houses. In the afternoon, visit the National Kandawgyi Botanical Gardens – 177 hectares with flower galore, forest land, and a lake. Take a relax walk through the gardens and enjoy the beauty of nature. Visit the Candacraig Hotel, built in the style of an English country house in 1905. There’s time for an optional coffee or tea break and opportunity to take photos of this classical place. After breakfast, drive all the way back to Mandalay. Upon arrival, drive a short way more to Amarapura. The Mahagandaryone Monastery of Amarapura is one of the most famous monasteries throughout the country. Here you can experience the monks’ life. We continue the trip to Sagaing Hill with its highlights from Budda Cave, Uminthonze Pagoda, Sunooponnyashin Pagoda. We then cross the river by ferry to Inwa (Ava), situated on the banks of the Irrawaddy River. Once a royal capital, Inwa is now a quiet rural oasis. Enjoy a horse cart ride around the peaceful countryside, visiting Bagaya Kyaung, a beautiful teak wood monastery, Maha Aungmyay Bonzan Kyaung, and Nan Myint tower. Afterward, we come back to Amarapura for the nearby U Bein Wooden Bridge. In the sunset, we walk over the longest teakwood of its type to Mahamuni Image – a bronze Buddha image castled during the lifetime of Buddha himself. After an early breakfast, make the 4-hour drive to Monywa, along the banks of the Chindwin River. First visit the Thanbodday Zedi temple complex and the Boditataung Pagoda, both known for their extensive Buddha statuary, and the Shwe Thar Lyaung Reclining Buddha Image on Pho Khaung Hill, the largest reclining Buddha image in Burma. After lunch, cross the Chindwin and make the 45-minute drive to Powin Taung stopping along the way to admire the stone-cut pavilions of Shwe Ba Taung. Known as the “Hill of the Alchemists”, Powin Taung Hill boasts several Buddhist cave sites from as early as the 16th century. Numerous Buddha images were carved along the stone walls of these caves, creating a gallery of different images. Throughout the centuries, mural paintings were added, which creates the richest mural painting collection in Southeast Asia. Overnight in Monywa. After an early start, depart for Pakkoku, one of the more famous towns in Central Myanmar. En route, visit Mau Ale Village, a fascinating ruined pagoda built in the 17th century. You can also observe the workshops of local incense makers and bamboo scale producers. After arriving in Pakkoku, visit the workshops of local blanket weavers (hand-woven!) and a marketplace specializing in thanakha (a traditional Burmese cosmetic made from tree bark). Afterwards, head to Bagan. Check-in at your hotel and enjoy your time at leisure. After breakfast, we start the day at Nyaung U Market where you have great chance to meet and talk with the friendly locals. Now we explore the beautiful Shwezigon Pagoda with the interesting knowledge of Burmese Buddhism. Follow up is a visit to Ananda Temple (one of the finest, largest and best preserved in Old Bagan). On this day, we also enjoy the unique experience of a horse-cart ride, continue to your day to the famous Nan Paya Pagoda. The last stop today is a local lacquer ware workshop and learn how this traditional piece of art is made. Breakfast at hotel. Today we visit Mount Popa, an extinct volcano standing 1518 metres high. The site is believed to be home to the ancient Burmese animist spirits. After 777 steps with bare feet to Popa Kalat Monastery at the top, we enjoy the panoramic view of Popa National Park. In the afternoon, we come back Bagan. Along the way we come to some local workshops of traditional palm, cigar maker and peanut oil distillation. Leave Bagan for your flight to Heho. 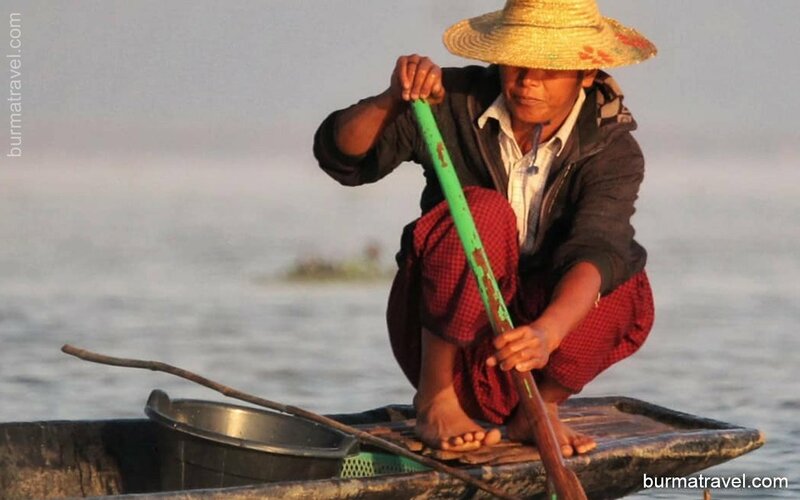 Inle Lake, the second largest lake in Myanmar, located 900m above sea level and is home to unique one leg rower Intha people. Upon arrival, we take the boat trip at Phaungdawoo Pagoda, which is believed as the holiest pagoda of Inle Lake. Now we go to Ngaphechaung monastery – an impressive wooden monastery over the lake. The monastery is also called “jumping cat pagoda” as in the past, the cats were trained to jump through the hoops. The next stop is Nam Pan village where we visit the cotton and lotus weaving factory, cigar making houses…; the sites will provide you with the interesting time interacting with the Intha people. Enjoy breakfast at hotel before setting out for your full day tour on the lake. You start the excursion to 5-day market. On each day, the market is held in one of 5 different places around the lake. At the market, you will see the local people trade local and traditional products, also the great chance to meet the tribes from the surroundings with their colorful clothing. Relax with the boat ride to beautiful temple of Indein on the western side of the Inle Lake. Enjoy your stroll among the hundreds of ruined pagodas in many shapes and sizes. Have breakfast at hotel, then we leave by boat to the northern bank of the lake where the car and driver is await for the drive to Pindaya. Along the way we enjoy the picturesque countryside of Shan State. This mountainous area is famous for its cave which is full of more than 8,000 Buddha images. Along the way, we visit the local handicraft workshops producing Shan mulberry paper and traditional umbrellas. Then transfer to Heho airport for your flight to Yangon. Upon arrival, our guide and driver will take you to your hotel in the city center. Rest of the day is at your leisure. Spend a half-day exploring Yangon and its highlights from Sule Pagoda, an important Yangon landmark centrally at the bustling area. The next stop is Shwedagon pagoda, the most sacred Buddhism place in Yangon and also the oldest pagoda in the world. The pagoda cannot be missed in your city tour. If time permits, we have the shopping time at the Bogyoke Market (formerly Scott’s market), one of the biggest markets in Yangon. (Be advised that the market is closed on Monday and public holidays). At the end, we transfer to the airport for departure flight. Have a good journey and see you again.